How healthy are your teeth? If you are like most adults, you might have a tooth or two that has suffered its fair share of damage, ranging from chips to full-scale infections. Fortunately, you don’t have to live with dental problems that interfere with your daily routine. 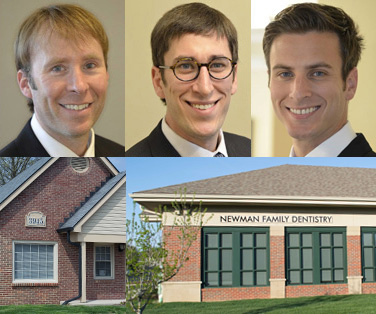 Newman Family Dentistry can help to repair your teeth through the art and science of restorative dentistry. Durable composite resins allow the doctors to reshape teeth, fill gaps, and cover root exposure. Dental adhesives and bonding have evolved over the years and are highly durable, capable of lasting as long as 10 years without touch ups. However, dental bonding isn’t appropriate for large-scale restorations, as other methods offer more stability. Extensive cavities or large root canals can leave a gaping hole in the tooth, which can make the tooth more susceptible to future damage—even with a filling. To restore the area with a solid piece of material, we can use inlays or onlays. These small, custom-milled dental restorations are cemented into place to replace large portions of the tooth. If your teeth are discolored, cracked, or otherwise damaged, they might be unsightly, which can be embarrassing. To correct their appearance and to keep bacteria and food debris from entering the tooth, Dr. Newman might recommend veneers. Veneers are paper-thin, tooth-colored ceramic coverings that are cemented to the front of your teeth. Veneers are a great way to completely makeover the look of the tooth, without capping the entire surface. Do you have any “problem teeth” that need repeated dental work, such as fillings? Over time, these teeth can become less structurally sound, which is why they may need a dental crown. Crowns completely encase the visible portion of the tooth, correcting its appearance and protecting the interior of your tooth. Crowns are also necessary when patients need root canal therapy. Do you have missing teeth? Full or partial dentures or bridges can help Dr. Newman to fill in those gaps and to perfect your smile. Dentures and bridges can also help to restore functionality to your mouth, making it easier to talk and chew like normal. The same composite resin that is used for cosmetic dental bonding is used to create aesthetically pleasing tooth-colored dental fillings. These fillings are as strong as traditional metal fillings, but don’t give that “previously damaged” look to your teeth. Instead, the repairs blend right in and are virtually invisible to the naked eye. When you lose a tooth, your jawbone starts to melt away in that area. In fact, within the first year after losing a tooth, you can lose as much as 25% of your original jaw ridge width. Your jaw requires constant stimulation from eating, talking, and chewing to stay strong. To recreate this stimulation, dental implants can be anchored directly into your jawbone. Implants create a durable, natural look. The purpose of restorative dentistry is to return form and function to the teeth so that you can eat, talk, and smile confidently and comfortably. Here are some of the other purposes of restorative dentistry, and why you should consider scheduling a consultation as soon as possible. Modern dentistry techniques like dental implants can replace teeth that have been knocked out or damaged beyond repair, but preserving your natural teeth is a much less expensive alternative. The goal of restorative dentistry is to return your teeth to health and to preserve the natural tooth root, so that you can avoid extensive dental procedures and live without dental problems. Dental infections can cause serious health problems, especially if you develop periodontal disease. Oral bacteria can eventually leach into your bloodstream, where it can spark inflammation and health problems throughout your entire body. One of the main purposes of restorative dentistry is to protect your health by fending off widespread infections. Restorative dental procedures like simple fillings can help to remove decay and stop infections in their tracks before they cause these kinds of problems. Preventive oral exams, such as oral cancer screenings, are important to help you to fend off potentially serious diseases—especially since over 120 serious disorders show symptoms in the mouth. Since tooth loss has also been tied to malnourishment and problems with memory, taking a proactive approach to your dental health by undergoing restorative dentistry can have a massive impact on your well-being and quality of life. "When your teeth have sustained an injury or suffered decay, restorative dentistry will bring them back to full health and function." Restorative dentistry is about more than protecting your health—it is also about protecting your self-esteem. One of the goals of restorative dentistry is to restore the look of your teeth, so that you can smile and talk to other people without worrying about how you look. Restorative dentistry procedures such as the placement of permanent crowns, bridges, or even dental implants can help you to look like you never had dental problems in the first place. Your Indianapolis dentist can also help you by placing dental implants, which work to recreate the natural stimulation that your jaw would normally receive from your natural tooth root. Because of this, dental implants help to fend off bone loss and changing facial contours due to a resorbing jaw. No matter what kinds of dental problems you struggle with, the our dentists at Newman Family Dentistry can help you to make your smile look brand new and beautifully white! Contact us today to schedule your next appointment.